The AutoTraq™ System is a complete solution to real-time graphical display and post test analysis of tracking radar data. Designed and developed by Weir-Jones Engineering Consultants Ltd. under contract for the Defense Research Establishment in Suffield, Alberta, and in constant use today, AutoTraq™ has significantly increased the efficiency of their Radar Tracking data acquisition facilities. Post-test analysis time has been decreased from days to hours. Real-time high resolution graphical display of the target's position imposed on a digitised map of the test area has increased the level of safety surrounding experimental robot flight tests. Visual and audible alarms warn the mission commander when predefined boundaries are crossed by the target. Boundaries are easily reprogramable using the interactive boundary editor, which allows boundary design directly on the map. On-line context sensitive help systems simplify the process of calibration and system configuration. 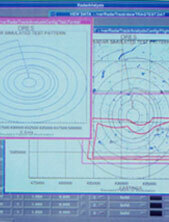 AutoTraq™ offers computer assistance in triangulating the position of the radar itself. It displays the position of the target in geographical coordinates; its height and its bearing relative to both the radar and relative to a programmable location; and its velocity, acceleration, and range.